Crown Status Recording!!! Top 50 of over 15,000 CDs evaluated. My copy sounds great. Heavy vinyl and lush, open sound. Avoid this one. It's a fairly recent bootleg reissue and has been mastered from a pretty noisy original vinyl copy. My version has the Buddha symbol on the lower right corner and stamped runout # 129409E1/A on both sides. No mention of the SS001/Ascensionale anywhere... Purple/brown spickled Buddha label and plain black innersleeve. Anyone else? Time To Go and The meaning of Love are two of my all time favorite songs. Beautiful, delicate and sad. The rest is a bit too experimental for me. By far, far his best album. He is out of his mind (it was the early 70's). Nice spacy album. He actually sings and I even like it which is highly unusual (liking a male jazz singer). but his singing is so whacked out it's good. 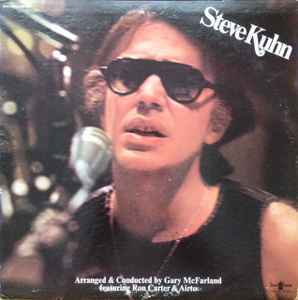 Steve Kuhn blows going into the 1980's. As soon as these performers come down off their high of the late 60's and 70's their music is less creative and very predictable. Out of my 8,700 jazz units this recording ranks in the top 5 of all time! not your typical Steve Kuhn recording. It's the 70's baby! and it's "out their"!! !